Ratis…that was how the island was called more than 1300 years ago. The name came from the Latin name of ferns covering the island. In the course of time, Ratis became Rhé, and then Ré. 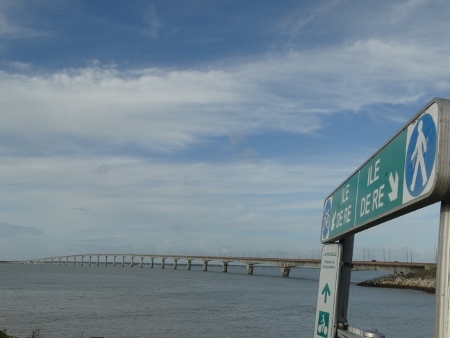 Having an area of only 85 square kilometers, Île de Ré is a small holiday island in France which is since 1988, connected to the mainland by a 2.9 kilometer-long toll bridge. With more than 100 km of safe scenic biking paths that run along the coast and pass thru picturesque charming fishermen’s villages, the island is best to be explored by a bicycle. Don’t worry, there are no mountains to climb; the highest elevation is only 20 meters! 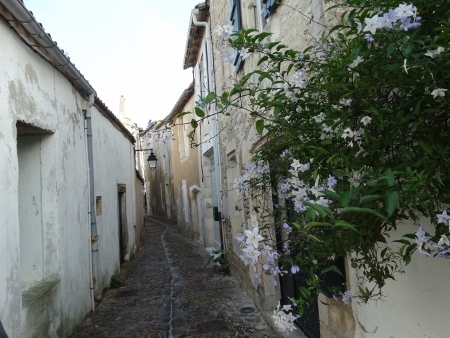 They said that Ile de Re has a winter population of 22,000 and during summer, it goes to staggering 220,00 high!!! Just to give you an idea on how busy it could be here in the summer months! 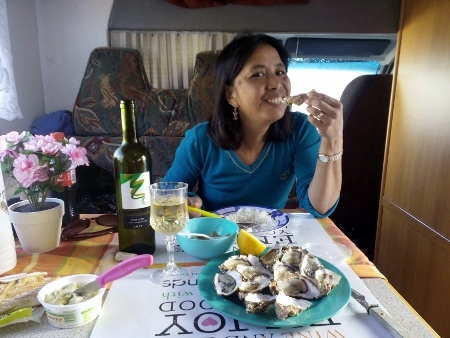 We learned about Île de Ré from a fellow RV owner, who was all praises about this charming Island. Curious, we searched for some information about it, and what we came to know interested us, enough to decide to drive there ourselves. So after staying one week in La Rochelle, we prepared for another exciting adventure in the Island. After paying 8 euro toll fee, we crossed the bridge, and found ourselves in no time in the island. The next hours were spent with looking for a possible free camping sites. After two wrong addresses, we finally found one by Plage dela Grand Marchais, in Les Portes. The following day, we went to explore the village. 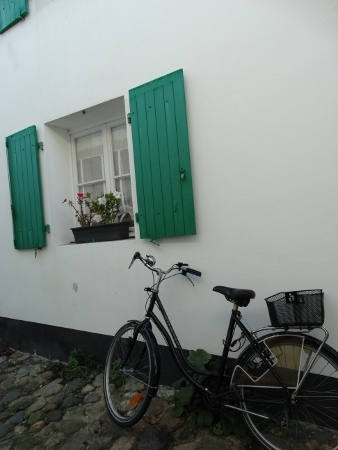 The village itself is nice, with off white houses and cute windows, most are colored in the shades of green. But the asphalted clean streets are somewhat deserted. We saw nothing but the houses, also few people walking. Since we didn’t have a map, we had to depend on our sense of direction. Some points have village map and there were we able to have orientation. We just kept on walking in the direction of the sea, until we came to another beach. 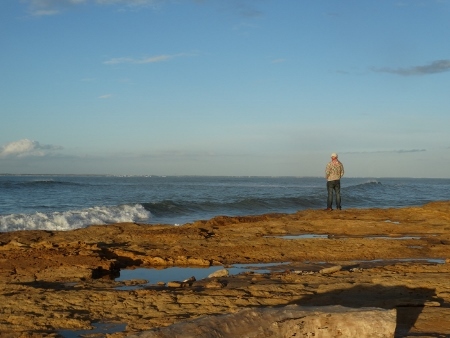 It was a wonderful sight, with the rock formation and sandy beach. We were alone and we could really fully enjoy the serenity of the beach! Big waves are rushing to the shore! We had fun walking there and taking pictures. We continued to walk on until we reached the beach where we parked the D’Traveller. 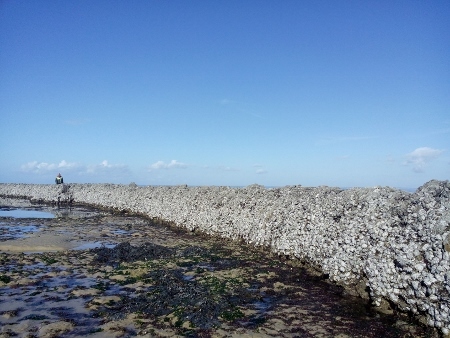 By the time that we were there, the water was again getting high and in short time, all the oyster beds were under water. We just stayed where we were, silently watching how the waves went by, and how the waters splashed against the seawall. The sun has set, and the sky had this light blue and a bit of orange color. That was our first day in the island. We spent the night there alone in that deserted parking area. After two days in Les Portes, we drove about 22 kms to go to our next campsite : Les Bois Plage en Re. At around 9.30, we arrived at the campsite. It is a free parking area reserved for at least 15 RVs, just opposite Camping Campeole. The beach Plage des Beofs is just a stone-throw away. From here, we biked to the historic village of Saint Martin de Re. Saint Martin de Ré reminds me a lot of Ibiza, but then smaller. It is totally surrounded by thick walls, one has to enter via a port. Its fortification, Fort Vauban, is included in UNESCO’s World Heritage list. One can take a long walk along the ramparts, with magnificent view of the Atlantic ocean. 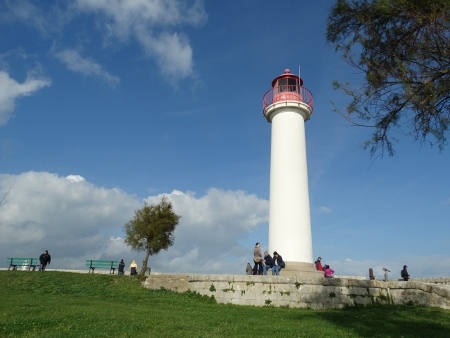 There is also a white/red lighthouse along the ramparts. The harbour is somewhat intimately small. It was low tide when we were there, and the boats were practically anchored on the ground. Around the harbour are a number of bars, cafes and restaurants, the prices of which are on the expensive side for me. The streets are concrete and narrow, with shrubs and roses at the sides. It is a pity that the plants are not in bloom, otherwise it would have provided us beautiful romantic sights. The wooden houses, which are normally white or off-white, are small compared to other cities and the windows are painted mostly painted in shades of light gray to green. There are also a number of small shops and boutiques along the narrow streets of the village. At the center is the Church of Saint Martin. 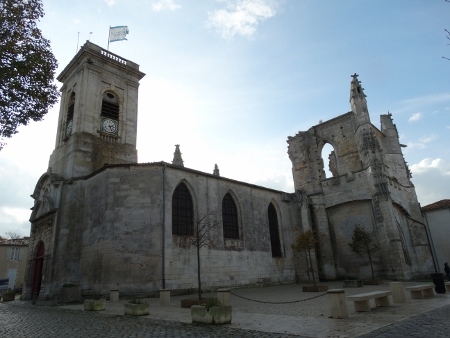 It has tower which is open to public (entrance fee – 1.85 pp) and offers a magnificent view of the village. We enjoyed a leisurely walk around the village, going first to the harbour, taking a seat once in while in a numerous benches found around the harbour. We walked through the narrow streets, and somewhat felt that we are in an open air museum because of the charms and authenticity of the cobbled streets and small houses. Sometimes it felt like we were in a maze, each street ending up in yet another small street. We also visited the church and went up the clock tower. It was very windy and cold, sometimes with drops of rain, but the views up in the tower are just wonderful We could even see the 3-km bridge from there. Having a long walk along the ramparts was relaxing.We felt the fresh wind that came from the sea constantly on our faces ! We just loved it! We sat in one of the benches there and had our lunch. It was 17.00 when we decided to bike back to our campsite. After doing some groceries, we finally arrived back at 17.30 . I was just in time to see another cloudy windy sunset at Île de Ré. It was a rainy and cold dat and we didn’t have much interest to go biking or walking. So we drove around trying to look for a suitable parking. We drove to a nearby village, Loix, which appeared to be a fishing village. On the way, we passed some salt fields. 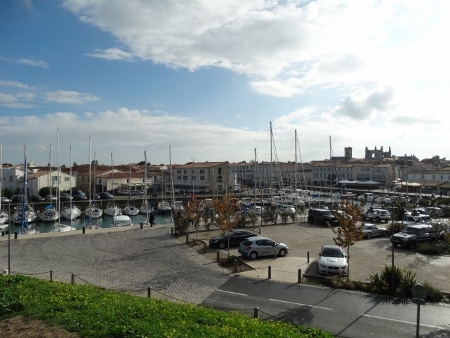 We arrived at Loix, but it looked like it was deserted, at least the small fishing port. There was no one in sight at 1 pm. There was nothing to do, so we drove further in the direction of the bridge. 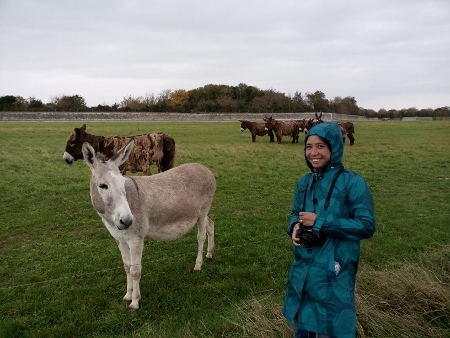 We passed some donkeys, one white and the others are brown and hairy! It was fun having pictures with them. I was a bit reluctant to call and touch them as I was afraid that they might bite me! At 14.00 we arrived at La Flotte, another small fishing village just 5 kms from St. Martin de Ré. They have a little intimate harbour, but almost everything is closed again. There were a few people in a café, for the rest, nothing. 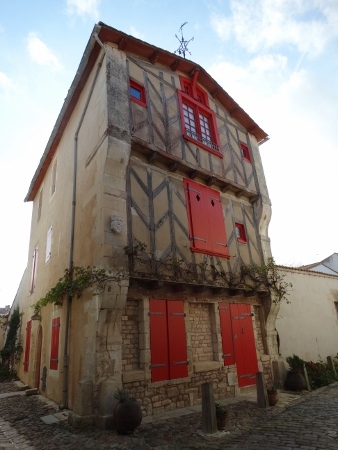 They have a little charming roofed market, medieval style, but then it was already closed. By this time we were getting a bit tired and irritated as we just kept on driving. We were contemplating on leaving the island and cross the bridge again. On the way, at the foot of the bridge, we saw a deserted beach. We tried to drive through the buslane and came upon a somewhat hidden place, behind a restaurant, with a very nice view of the bridge on one side, and the beach on the other. It couldn’t be better. We stayed the night there. We had a quiet night, sometimes disturbed by drops of rain and hard gush of winds.The next day, after some picture taking, we said goodbye to Île de Ré, crossed the bridge, and returned to the Mainland. 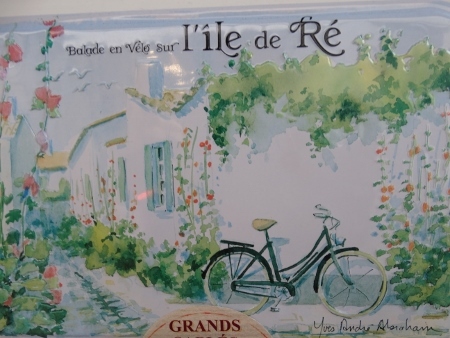 Our three-day stay in the idyllic island of Île de Ré has provided us not only a temporary escape from the hustle and bustle of the mainland; it also gave us that special Island feeling- a feeling of complete rest and pure enjoyment of the nature. We were lucky to experience this, even for a short time. Île de Ré, until next time.